At the end of the turn, the skis tend to "get ahead" of the body and we need to "catch up to them". Recentering refers to getting back forward on the skis, in the transition. The basic need in transition is to get back on top of the boots, to start the new turn centered and with sufficient weight on the tips of the skis for the desired performance. At the high performance levels, we need to move the upper body ahead of the feet (i.e. the hips in front of the boots), in the line of travel and toward the apex of the turn1. Depending on how and where the skis are released, we can get the hips ahead or on top of the boots by pulling the boots back and/or pushing the hips forward (read early pressure). Floating in transition makes it easy to pull the boots back2. Dorsiflexion (i.e. closing) the ankle is a major component of getting forward. 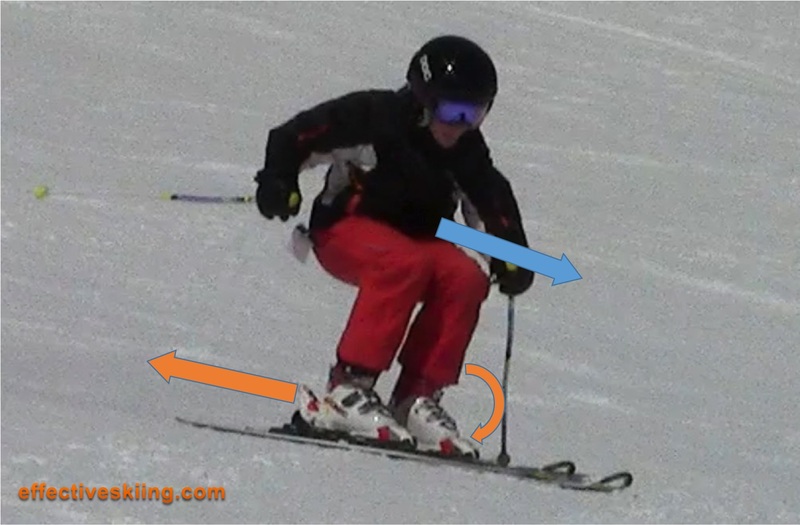 This will bring or keep the skis back and/or hips forward and allow boot shin contact. There are countless choices, variations and combinations of these movements, as well aided by the upper body when needed. Another movement that aids in recentering and maintaining fore/aft balance is pulling the inside ski back in transition and continuing to pull it back throughout the turn2. This also enhances tipping. 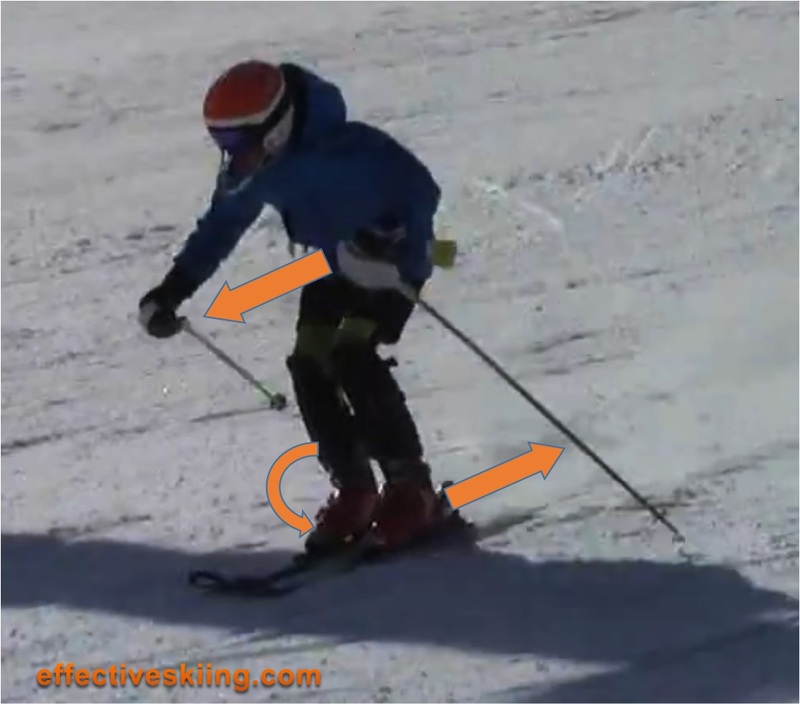 Many skiers focus on trying to recenter by pushing the hips forward. That is of course possible: co-contract at the hip and knee and flex/close the ankle - it will result in the entire upper body rolling forward and the hips getting forward. Then, just extend at the knee and hips and it will bring the hips forward. One issue with that is that we tend to push in the heels and that tends to result in pressure on the tails of the ski... which is not a good thing to have just as we try to start carving the skis with the tips... Of course, they also launch the big mass of the body, setting it in motion (or adding to the momentum, since you were not stationary) which is both much slower and more prone to making mistakes and overshooting (big mass, big muscles etc). It is quite customary to use this method at the lower levels, where it is combined with vertical movement (the extension/push). Read Low and forward for a larger discussion. See Recentering in fore-aft and Keep your feet underneath you for details and learning sessions. In transition. The movements can start as early as the release of the previous turn, which is the one that we use to impulse different body segments. We should be careful and watch out for Early pressure - as pushing too early into the skis is not great timing - for instance a late "push" to get the hips forward, may negatively impact the next turn. 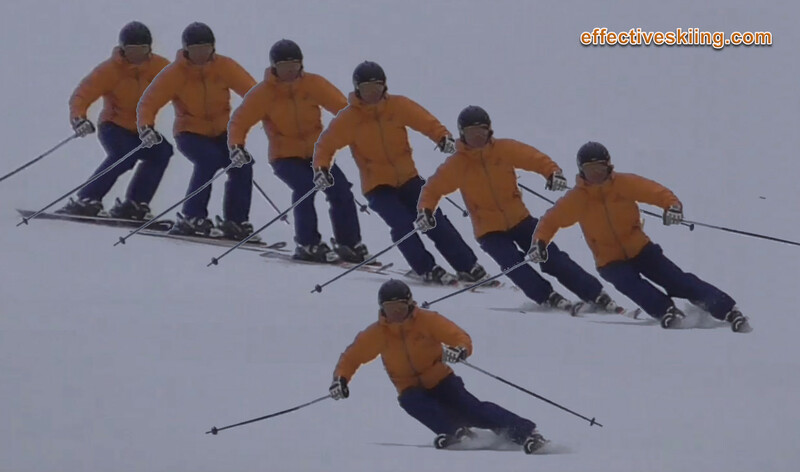 Racers are generally keen to "steal" as much lateral momentum from the previous turn as possible, to get across the hill - this is when the hips can be impulsed to move forward into the new turn. Just how much should we recenter? It all depends on the next turn, the situation, snow condition, desired turn shape etc. From a green relaxed skier which needs a very subtle movement to stay on top of the boots, to a World Cup racer taking tight turns on really steep ice. Remember that we do not need to flex the boots to be in a good centered/forward stance. We may need to aggressively use the boot cuffs in the turn, but to just recenter, the presence of pressure on the cuffs is a good sign, if the boots are properly setup. Member-only content avilable (151 words). Viewed 1494 times ( | Print ) this page.